UNSW has developed new dielectric patterning techniques to replace photolithography. Less steps, less and cheaper chemicals for manufacturing high efficiency solar cells. UNSW holds the world record for the efficiency of single junction silicon solar cell. The record of 25.0% was achieved using photolithography, which is too expensive for large scale commercial implementation. The UNSW patterning techniques, which use inkjet printing or aerosol jet printing, are cheaper than photolithography. They avoid the use of expensive masks and mask aligners. Digital images represent the etching patterns, so they are easily prepared and changed. The etching pattern is printed to form openings in a dielectric layer of silicon dioxide or PECVD silicon nitride. The ‘resist’ technique typically etches grooves of 45 μm width, and holes ~40 μm in diameter. A single resist layer can be used for multiple patterning processes. A resist layer is formed over the dielectric surface. 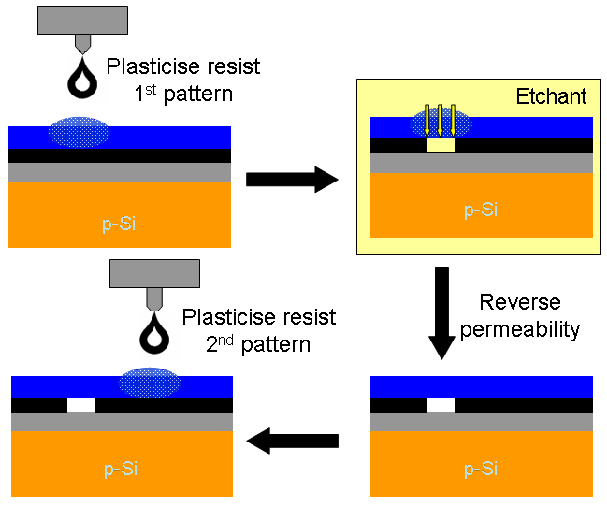 Patterned deposition of a plasticizer forms permeable regions in the resist layer. Aqueous etchants then permeate through the patterned resist areas, and etch openings in the dielectric layer. The ‘direct’ technique, requires fewer steps and uses less and cheaper chemicals than photolithography. 1. An acidic polymer layer is formed over the dielectric surface. 3. The fluoride ions react with the polymer to form hydrogen fluoride (HF) locally, which then etches the underlying dielectric layer. Immersion etching step is not needed so therefore largely reduced quantities of toxic and corrosive etching fluid. Etched regions can be metal plated to form front metal contacts to the solar cell. Significant OH&S advantages by reducing operator training expenses and waste disposal issues. Other uses such as enhanced light capture into the cell by texturing the silicon surface with dielectric masks created using UNSW’s dielectric patterning techniques. Collaborative partnership with UNSW to introduce production of high efficiency solar cells for large scale commercial production.